how would you cover the underside of this wing type of approx 72inch span & 18 inch cord. the wing is very thin with a lot o under camber. I attach the covering to the spar nearest the deepest part of the undercamber, and make a good secure job ny applying heat sensitive glue to the spar. Having done that I will pin a strip of balsa over the spar, to keep the iron offthe spar and pulling the covering off. I then do the front and back. I would do the whole job with an iron. Not enough fine control with a heat gun. I would do as Don says but before that give all the edges of the parts that you want covering to stick to ie; spars and ribs a good coat of Solarlac "Claercoat " full strength and allow to dry thoroughly if you have any left . Failing that a coat of De-Luxe materials "Cover Grip" These are heat sensitive adhesives . Once covering is fixed to the spar work out along the ribs keeping the covering as tight as you can . When all of the bottom of wing is covered go over the ribs or glued covering again to secure firmly .You can now use either an iron or a heat gun (my preference ) to take out any wrinkles and make covering taught, but be careful not to overhear the bits that are stuck down . thanks guys, i was thinking about stitching it. has anyone tried. Rib stiching works very well but is very time consuming. You will have to use a tex type covering to do this as tapes will have to be used over the stiching. Early aircraft like this had torn tapes not pinked tapes on modern aircraft. 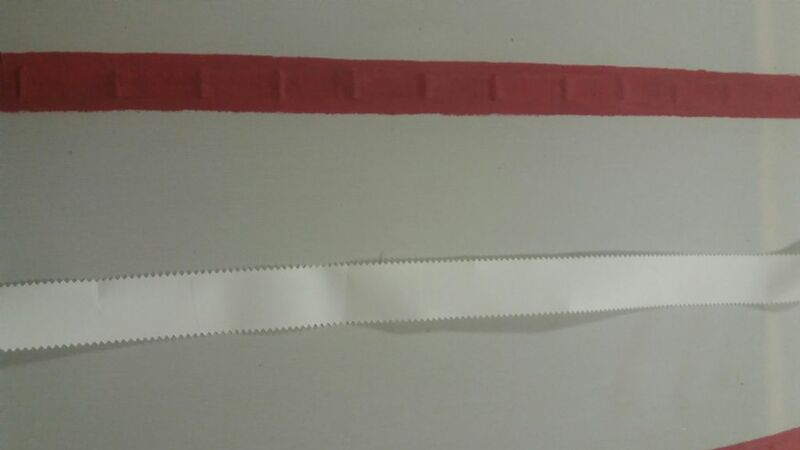 If you peel the baking plastic off the covering you can nick the covering at the spacing you want and just tear the strips to the desired width. The first one may vary in width but the next one will be a constant width. We did this on a 1/3 Reeves Bleriot. I am also uing torn tapes on my Cub, this is how it looks compaired to a laser cut one. The stiching on this is only dummy stitching. I have done stitching in the past. But it's slow, very slow. Done properly ironed on material stays put. I had a junior 60, undercambered wing. I built it in 1980, sold it as a tidy flying modelin 2005, still with the original solartex covering.